I had a great 1:2:1 meeting on Friday morning with Pete Whiston. Co owner of Alexander Gow Ltd. Alexander Gow Ltd is an accountancy company with offices in Blackburn, Cheadle and Lytham. Peter was introduced to me by Ed Nash at a Leadsnet networking event. Peter is a former professional footballer who now plies his competitive nature in the Financial Services World. Peter particularly impressed me with is his fresh approach to running an accounting business. He is not an accountant by trade, which facilitates his ‘alternative’ view to running a practice. Why Ed Nash & Leads Net Chose me? Superfast set up – Start taking card payments within days. Lowest rates guaranteed – Cut down your card costs by as much as 40%. 24/7 UK support – Expert assistance whenever you need it AND We promote your business – Contact me for a No Obligation Quote or Review your current charges! We chatted freely about our sporting careers and experiences before moving on to our business aspirations. 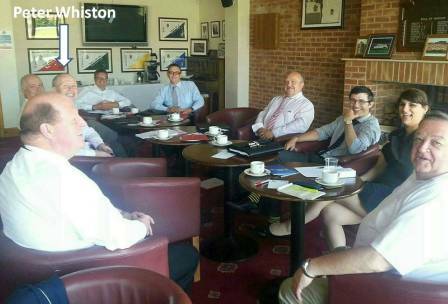 Peter is planning, in conjunction with Ed Nash, a promotional event at the Fylde Rugby Club to showcase his Accountancy practice. I have pledged my support and look forward to the event. This entry was posted in UK Chip & PIN Ltd. and tagged @LBVmagazine @OssyMill @ELancsChamber oswaldtwistle, accept credit cards, authorisation, barclaycard, bookkeeping, card processing, cards, Credit card, Debit, East lancs, first data merchant services, First pitch, Free guide Merchant Services, interchange, LBV, low merchant fees, lower merchant fees, Market traders, merchant account, merchant bank, merchant fees, payment terminals, PCI, rates, retail merchant services, streamline, switch merchants by Cornel Sampson. Bookmark the permalink.